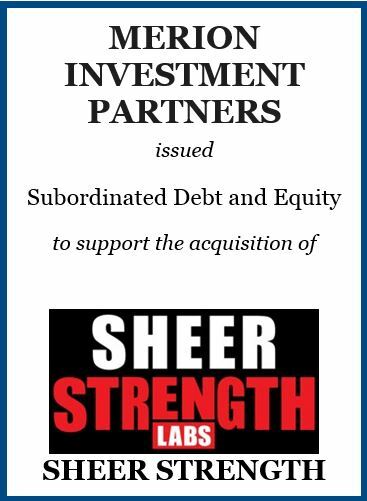 Merion Investment Partners III, L.P., is excited to announce a new investment in Sheer Strength (the “Company”), one of the fastest growing sports nutrition companies in the United States. Merion provided subordinated debt and equity to support Baymark Partners and its acquisition of the Company. Sheer Strength uses only the highest-quality, most effective ingredients available, carefully formulated and manufactured for optimum results. All of the products are built on a solid foundation of proven science and real results with accurate and transparent labeling. The Company has become one of the leading supplement brands sold through several e-commerce channels.